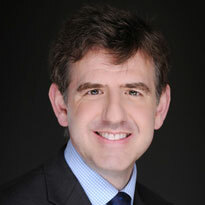 Dominic specialises in international arbitration, regulatory and disciplinary law. He received his CEDR Accreditation in 1997. He is a Solicitor Advocate. Dominic began sitting as an arbitrator when he was the Head of International Arbitration in the London and Paris offices of Mayer Brown. In 2004, he left to develop that expertise; Chris Newmark joined him in 2007 to form Spenser Underhill Newmark LLP. 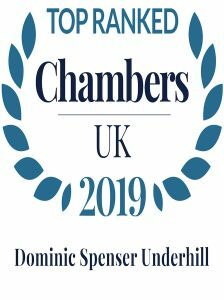 Dominic has been a member of the ICC Commission of International Arbitration and ADR since 1998, is a member of the LCIA Company. He has particular experience of arbitrations under the ICC Rules, LCIA Rules and LMAA Rules, as well as under both the 1976 and 2010 UNCITRAL Rules. 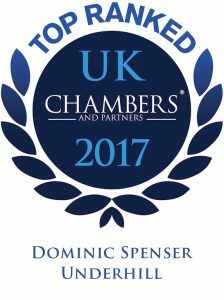 Dominic also has experience acting under the Bar Council Arbitration Scheme, as well as arbitration rules of various trade associations. As Counsel, it is believed that he was one of the first advocates in the world to conduct an arbitration under the UNIDROIT Rules (applying UNIDROIT to a satellite dispute). Dominic is a Fellow of the Chartered Institute of Arbitrators, a Fellow of the Society of Advanced Legal Studies and a Member of the Worshipful Company of Arbitrators in the City of London. He is also a visiting professor in international arbitration at the University of Turin and visiting lecturer at the School of International Arbitration, Queen Mary University of London. Dominic has written and lectured extensively on arbitration and dispute resolution.